Sir Frederick Sargood is believed to have assembled the first major collection of orchids in Australia at Ripponlea (his estate at Elsternwick, a Melbourne suburb) in 1883. His interest in orchids was sparked by a visit to England in 1880-1882, for not only did he return to Melbourne with a large collection of orchids but he also ‘imported’ two gardeners to care for them! It now appears that George W. Knight, City Surveyor at Sandhurst (Bendigo), also accumulated a substantial orchid collection, beginning in 1884. Knight’s copy of the fifth edition of B.S. 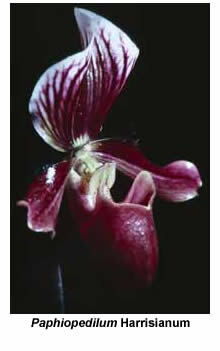 Williams’ The Orchid-Grower’s Manual, published in 1877, has recently been found. Knight inscribed his name in the frontispiece of his copy and also noted in the margins the orchids that he had acquired and when they first flowered. 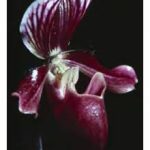 Knight’s notes indicate that he acquired his first orchids (seven species and two hybrids) during 1884, followed by at least a further 46 orchids the following year (other entries list only the date of flowering, not of purchase). A total of 89 orchids were marked altogether. 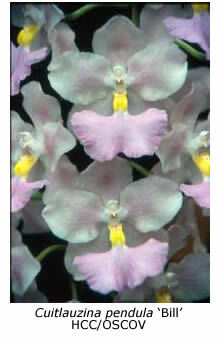 Four of Knight’s first orchids, acquired in 1884, were paphiopedilums, then known as cypripediums. 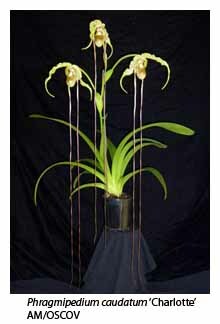 Two (Paphiopedilum concolor and P. niveum) were species, while the other two were hybrids (P. Dominianum and P. Harrisianum). His P. concolor produced four flowers in 1888, while P. niveum had three, results that would delight most modern growers. He also purchased two odontoglossums (Odontoglossum hallii and O. rossii, now Rhynchostele rossii) in 1884 but there is no indication that either had flowered. Knight grew four cattleya species and must have been especially pleased with his plant of Cattleya mossiae ‘albo-marginata’, as (according to his note in the margin) its flowers measured 7.5 x 7 in. 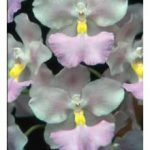 Considering Bendigo’s hot summer weather, he did well to flower Odontoglossum crispum in 1888, when it displayed its “beautiful pure white blooms” during the entire month of August. Another orchid that deserved special mention was Odontoglossum citrosmum (now Cuitlauzina pendula), which in December 1888 produced flowers that were “lovely, large white, of great substance, (and) highly perfumed”. A note in the margin reveals that Trichopilia suavis produced twenty blossoms in late August 1888, while his Sophronitis grandiflora (now S. coccinea) also flowered in August the same year. We know that George Knight purchased some of his orchids from William Bull’s Establishment for New and Rare Plants of the King’s Road, Chelsea (England). Bull’s nursery was one of several great orchid nurseries of the era, two others being Sander’s of St. Albans and Veitch’s of Chelsea. Bull imported plants from Africa, India, Japan and North America, and commissioned Edward Shuttleworth and John Carden to collect for him in Colombia. He was one of the first sixty chosen by the RHS to receive the Victorian Medal of Honour commemorating Queen Victoria’s jubilee in 1897. A letter written by William Bull was found sandwiched in the pages of Knight’s copy of The Orchid-Grower’s Manual. Dated 28 October 1885, it reads (in part): “Your letter of the 15th August duly reached me and I have now forwarded by P & O “Carthage” a case containing the Saccolabiums as per enclosed invoice. I have sent two extra strong plants of Cypripedium caudatum and C. caudatum roseum and charged half price for them. 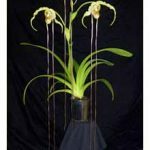 I have also sent extra strong plants of the two others that failed.” Three of the saccolabiums that Knight ordered are now known as Ascocentrum ampullaceum, A. curvifolium and Rhyncostylis gigantea, while Cypripedium caudatum is now called Phragmipedium caudatum. It’s surprising that so few of Knight’s purchases died in transit, which would have taken about two months, as calculated from the above dates. George Knight was born in London in 1831. He qualified as an architect and practised as a civil engineer before coming to Australia with a younger brother in 1854. After arrival in Victoria he was appointed Government Engineer and supervised the construction of a railway line to Williamstown and the Sunbury section of the main railway line to Bendigo. Subsequently he established a vineyard at Sunbury but soon sold it and moved to Bendigo, where held the position of City Surveyor until retiring in 1886. During that period he established nurseries, vineyards and orchards on four different sites in and around Bendigo, trading as the Knight Brothers. The Rosenburg nursery at Back Creek was established on former gold diggings only after turning over the whole site to unearth the fertile soil and bury the clay and gravel that the miners had brought to the surface. William Knight was a Fellow of the Royal Horticultural Society of Victoria and served as a Justice of the Peace and Magistrate in Bendigo for fifty years. He died in 1923, aged 93. We thank Mr. Darren Wright of Bendigo for lending the authors Knight’s copy of the fifth edition of The Orchid-Grower’s Manual, and Mrs. Helen Mainka of the Bendigo Historical Society for her research.